It’s not clear to me whether In a Strange Room is a novel or three slightly linked short stories. I’ve seen it referred to as both. The linkage comes from journeys, as each section deals with a journey the narrator takes with different people. This narration is complex. 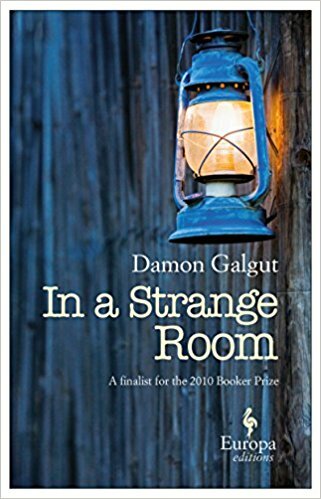 South African novelist Galgut himself is the narrator, but he speaks both in first and third person, the one hinting at intimacy, the other, more often used, at distance. The first section, or story, “The Follower,” deals with a journey in the early 1990’s with a German named Reiner. The narrator meets him on another trip, and although they do not know each other well, they correspond. Eventually, Reiner comes to Africa, and the two take a journey through Lesotho. It’s difficult to understand what the narrator sees in Reiner besides good looks, and eventually the trip becomes a battle for control. The second section, “The Lover,” starts with Damon latching on to a group of Europeans traveling in Africa after he leaves the group he started with. He keeps running into them when he is with the first group and offers to help them when they are turned away from the Malawan border for not having visas. Damon and Jerome are attracted to each other, but they can barely communicate, as Damon doesn’t speak French and Jerome barely speaks English. In “The Guardian,” Damon takes his old friend, Anna, on a trip to India. She has recently been hospitalized for mental illness, and Damon finds it increasingly difficult to deal with her. I didn’t really enjoy Galgut’s novel about E. M. Forster, so I wasn’t exactly looking forward to reading this novel for my Booker Prize project. But I am happy to say that I found In a Strange Room powerful and touching. It is sparsely written but completely involving. Even though it doesn’t explicitly express emotion, it still evokes an emotional response. I am happy to have changed my mind about Galgut. Queen Eleanor and Fair Rosamund is the second of two novellas by Mrs. Oliphant contained in my Persephone Press edition of The Mystery of Mrs. Blencarrow. Although I was disappointed in the first novella, I found this one much more sensational and touching. Both are about the consequences of middle-aged passion. Those who are more aware of their British legends could probably guess where this story was going right from the beginning. It took me a bit longer. Mrs. Lycett-Landon lives a contented existence on the banks of the Mersey outside Liverpool. She has married a successful businessman and has two cheerful children. Her son Horace is just old enough to join his father’s firm and is day-dreaming about the success he’ll make of it. Her husband Robert is an affectionate father and spouse. Robert has been speaking of sending Horace to the London office to train with young Mr. Fareham, the nephew of Robert’s partner. 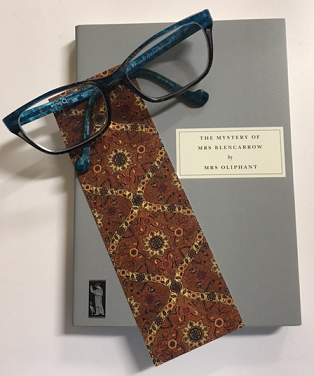 However, after a business trip, Robert tells Mrs. Lycett-Landon that the London office is in disarray because of Fareham’s undisciplined work habits. He will have to travel more to London and stay longer to sort out the trouble. Robert is home less often after that and is irritable when he is home. He looks eager to leave when he returns to London and seldom writes home. If you can’t guess what is going on, I’m surprised, but his family has no notion of it. It is actually even worse than you’re probably guessing. The question is not so much what Mrs. Lycett-Landon discovers as what she decides to do about it. Although it’s hard to imagine a woman dealing with this problem in the way she does, I was touched by Mrs. Lycett-Landon’s solution. I found this a much more involving story than the other. In both, the person involved holds back information, but in this one, it’s to more effect. Like Olive Kitteridge, which this book reminds me strongly of, Anything Is Possible is a series of linked short stories. What links these stories is Lucy Barton, the main character of Elizabeth Strout’s previous novel. Each story is about a family relation of Lucy or a resident of her home town in rural Illinois, and Lucy appears as a character in one story. In “The Sign,” Tommy Guptill, who was the janitor at Lucy’s school when she was a girl, goes to visit Lucy’s brother Pete. There he learns that Pete has long believed a terrible thing about the night long ago when Tommy’s dairy farm burned down. In “Windmills,” Patty Nicely, a school mate of Lucy’s, is able to overcome an insult from Lucy’s niece and help her make her own escape from town. Patty also reviews her life with her gentle husband Sebastian, who has died. “Cracked” explores the strange marital life of Linda Peterson-Cornell, Patty Nicely’s niece. Although Linda has married a wealthy man and escaped poverty, her husband has some disturbing pastimes. In “The Hit-Thumb Theory,” Charlie Macauley, to whom Patty Nicely is attracted, is devastated to find out the truth behind his relationship with a woman. In an attempt to recover before going home, he goes to stay at a B&B. Later, we hear from the B&B’s owner, another relative of the Nicelys. And so on. These stories are beautifully and perceptively told, evoking sympathy for even the most unlikable characters. As I was for My Name is Lucy Barton, I was caught up in the gentleness and empathy of these stories. Cloud Atlas is a reread for me, and I think when I first read it, it was my first postmodern fiction. I found it, and still find it, astonishingly inventive and compelling. Like its namesake, “Cloud Atlas Sextext,” the musical composition that recurs throughout the book, Cloud Atlas is composed of six stories, but with various themes and motifs linking them. Each story is set farther into the future. A story begins and is cut off at a climactic moment until we get to the sixth, which is complete. Then, going back toward the past, the stories are completed. “The Pacific Journal of Adam Ewing” is the journal of a man traveling in the Pacific in the 19th century. On his travels he observes the shameful treatment of the natives by missionaries, rescues a native from slavery, and encounters a series of scalawags. A quack befriends him and begins treating him for a supposed worm. In “Letters from Zedelghem,” Robert Frobisher writes his dear friend Rufus Sixsmith about his adventures. Frobisher is a gifted composer but impoverished and a bit of a scalawag himself. In 1931 Belgium, he talks his way into a position of amanuensis for a great composer. While there, he begins writing the haunting “Cloud Atlas Sextet.” But he finds he is not the only con artist in the house. “Half-Lives: The First Luisa Rey Mystery” is a manuscript mystery novel about a reporter who finds out about safety hazards in a nearby nuclear power facility. Her informant is Rufus Sixsmith, now in his sixties, a Nobel winning scientist. After Sixsmith is murdered by the corporation that employs him, Luisa begins trying to get a copy of the report he wrote, which is being suppressed. “The Ghastly Ordeal of Timothy Cavendish” is a movie set in the present or near future. In it, a publisher in debt is being threatened by thuggish clients. When he goes for his brother’s help, he is tricked into committing himself to a home for the aged. “An Orison of Sonmi-451” is an oral history dictated by a fabricant from prison, some time in the future. She relates how she became enlightened and got involved with a revolutionary movement against the corprocacy that controls the 12 cities still habitable on the planet. “Sloosha’s Croosin’ an’ Ev’rythin’ After” is a story told to listeners in the far future. By now, most of the world is living as primitive tribes, and Zachry’s tribe lives in Hawaii as farmers and goat herders. But a Prescient named Meronym comes to live in the village. These people are the only ones who have kept the scientific knowledge of the time before. Zachry suspects her of motives for being there that she has not told them. Each of these stories is written in a different style reflecting its time period and with language evolving in the future. The stories share thematic threads and invoke each other’s characters, mixing together the “fictional” characters with the “real” ones. Luisa meets Sixsmith, Robert Frobisher finds Adam Ewing’s journal, Zachry’s tribe worships Sonmi as a god, Sonmi watches the movie about Cavendish. 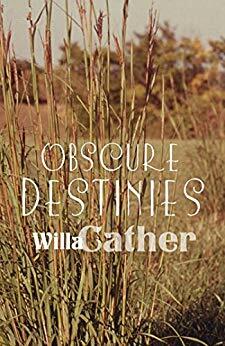 Intricately plotted and fitted together like puzzles, these stories comprise an amazing novel.